Corporate earnings have largely been a disappointment in the recent past. In spite of that, Indian equities continue to rally, trading at premium valuations. This, according to brokerage Nomura, is a function of changing sector weightages in the Nifty index. “When we compare the valuation multiples compared to the past, we need to recognize that the composition of market (index) has materially changed. The valuation multiple for the Nifty is driven by a change in composition as profit contribution from high-quality companies that command higher valuation multiples has risen over the years," it said in a report. As the chart alongside shows, in the past 10 years, the weightage (in terms of market capitalization) of sectors such as financial services and consumer discretionary has risen significantly. The share of financial services has more than doubled during this span, with the sector now having the highest weightage in the index. Within financial services, while the weightage of retail banks has risen sharply, state-owned lenders have been laggards, given their stressed balance sheets. In simple terms, only a handful of stocks within the financial sector have done well on the earnings front and are responsible for the Nifty’s rich valuations. Incidentally, this distortion is not restricted to the index’s pricey valuation. Despite their large share of market capitalization, the share of financial services in overall gross value-added (GVA) is not very high. Indeed, the “financial services" category accounted for a mere 6% of total GVA at constant prices in FY16. However, if we leave out the agricultural and “community and personal services" segments from total GVA on the grounds that these have very low representation in the equity markets, then its share rises to 8.3%. So, there’s a vast difference between the contribution of the financial sector to GVA in the economy and its weight in market capitalization. 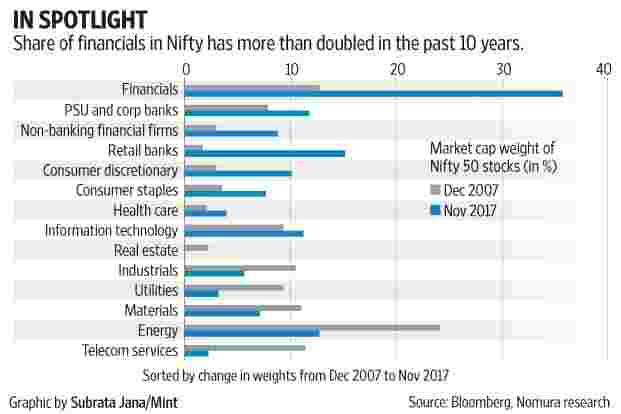 “Increased weightage of financial services in the Nifty has more to do with the better performance of specific stocks than the sector as a whole. From the perspective of contribution of this sector to GVA growth, there has not been much value added because their profitability and productivity have taken a hit. Credit growth is still subdued. While there may be a plan for further fund infusion, the NPA (non-performing assets) mess has not cleared completely. So, this is an anomaly as increased weightage of financial services, particularly banks, may not necessarily mean the sector is significantly contributing to economic growth," said Madan Sabnavis, chief economist, Care Ratings Ltd. In short, while higher sector weightage in the index may indicate increased financialization in the country, the same may not be a correct reflection of ground reality.